The Chairman of PricewaterhouseCoopers in Malaysia, Dato' Johan Raslan exposes himself as a hypocrite on his Twitter page. Albert Einstein, the great Swiss genius believed strongly in absolute standards of right and wrong. When the public perception at his time began to confuse his groundbreaking work ﻿on the relativity of time and motion with relativity in morality, he was unequivocal in his response. Einstein said,“Relativity applies to physics, not ethics.....The meaning of relativity has been widely misunderstood. Philosophers play with the word, like a child with a doll. . . . It does not mean that everything in life is relative.” The great man was very unhappy that his works in the objective world of science were being dragged into the subjective inner world of human morality, attempting to show that there can be an absence of absolutes in the moral sphere. Will the great man be happy to see his words now being tweeted by Johan Raslan, when Johan has failed miserably in upholding what is right in corporate governance, in due respect for the process of law, in allowing and even participating in actions that are fraudulent? In what way have PwC Malaysia and Johan Raslan shown that they believe that there are no excuses for breaking the rules and that no compromises can be made in ethics? Do you consider the appointment of Mr Manohar Benjamin Johnson, from being an Executive Director in PwC Malaysia to that of Director of the Audit Oversight Board under the Securities Commission, allowing him to regulate the very firm he worked for, an example of absolute impartiality? Is there absolutely no room for conflict of interest there? Do you consider the registration of your firm, PricewaterhouseCoopers Malaysia, by the very same Audit Oversight Board, as Auditors on the very same day the Board members were themselves appointed, on its very first day of operations, before even the legislation to collect the fees and its mechanism had been approved, under very questionable circumstances, being both physically and legally impossible, an example of an act of total lawfullness, of total integrity, of complete and utter uprightness? 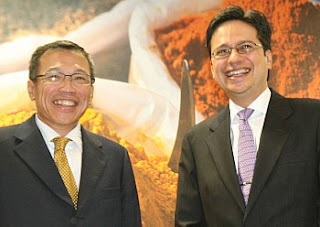 Do you consider the act of appointing Ms Chu Kum Yoon and Mr Foong Weng Chee as Directors in your "consulting arm" PwC Consulting Malaysia Sdn Bhd (289801-A) as part of the sale to IBM Corp, an act of total rectitude? Is your position as shareholder and Director in PricewaterhouseCoopers Consulting Sdn Bhd (464379-U), where hundreds of millions of Ringgit in contingent liabilities is being kept, to effectively defraud creditors, an act of total and complete legality, devoid of any and all elements of fraud? Are your continuing audits, of not only IBM in Malaysia, but many other listed entities, while PwC Malaysia cannot even defend its own registration by the oversight board, and example of acts that are rule-governed and completely licit? Dato' Johan Raslan have you wondered, if your actions and those of PwC in Malaysia so far, can even comply with PricewaterhouseCoopers's very own Code of Conduct? How much longer can you keep silent on the many questions raised here? We know you refused to take any calls the entire day when this article about your ambition to be the next Chairman of the Securities Commission appeared in RPK's MalaysiaToday, but shouldn't you have some answers by now? We believe that the spirit of Albert Einstein has been disturbed enough by your tweet already, so we will not quote him to end this piece, but use the words of another great man, Albert Camus. "A man without ethics is a wild beast loosed upon this world". We now ask Mr Coenie Van Beek, the Global Leader for Ethics and Business Conduct in PwC, a few questions. 1. Have you lost control over the ethical and business conduct of PwC Malaysia and its senior partners? 2. Why is the ongoing fraud perpetrated by PwC in Malaysia with regards to the non disposal of PricewaterhouseCoopers Consulting Sdn Bhd (464379-U) to IBM Corp, when PricewaterhouseCoopers LLP sold its global management consulting and technology services business to IBM Corp back in 2002, still left unquestioned after more than 8 years? 3. Why are PwC in Malaysia continued to allow to audit IBM in Malaysia when all of this remains unresolved? 4. What are the implications on the global audits done by PwC for IBM Corp? 5. How much longer will it take for the silence to be broken, and action to be taken? Hypocrites are all around us.